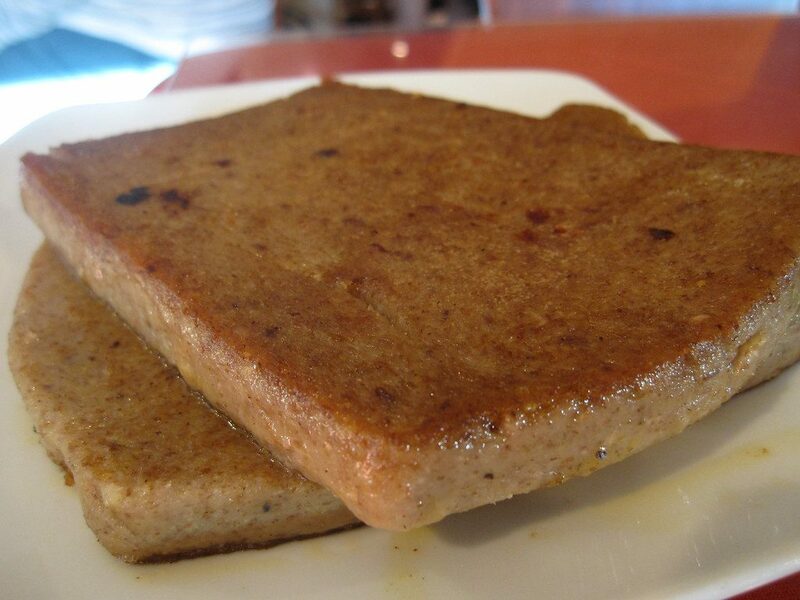 Scrapple is made from all the parts of a pig that don’t get used for anything else. This sets it aside from its cousins headcheese and souse, which are primarily made from the scrap meat off the head of the pig after the brains are removed. Let me be perfectly clear here: Brains are NOT an ingredient of Scrapple, headcheese or souse. When I was growing up on a small dairy farm in the Midwest in the 1960s, fried scrambled eggs and brains was a rare delicacy. Rare because butchering time came around once a year. One or two of the yearling bull calves (raised on grain and green grass, no supplements in sight) were sent to the local processing plant for butchering. The meat was then either stored in a rental meat locker or brought home to place in a freezer at home. Brains don’t store well and each animal only has one. Therefore, delicacy. No one thought anything of it, other than it was a matter of personal taste not enjoyed by everyone. In 1986, mad cow disease was discovered in Great Britain. It was the beginning of an epidemic lasting through 2001. The problem was caught early, so as epidemics go it was pretty small. Only 178 humans in Great Britain were diagnosed with Creutzfeldt-Jakob disease (CJD), the human form of bovine spongiform encephalopathy (BSE), which can only be contracted by eating infected beef products, especially brains. Only 4 cases were reported in the United States. Still, I do look back on those days, and I’m sort of glad that brains were a delicacy, and didn’t appear on the table very often. And I’m glad to know that brains are not ingredients for headcheese or scrapple. Another “back on the farm” memory was making headcheese, which is very similar to scrapple. The big difference is that head cheese uses only the head, while scrapple uses any odd bit of the pig that doesn’t get cooked up into something else. The other difference is that headcheese doesn’t have any cornmeal added to it. There is a saying about the central part of the United States. We didn’t notice the depression because times weren’t that good there in the first place, and we didn’t notice when it moved on because times were still hard. So if you butchered a cow or a pig, you made very sure to use up every part of it. A meat animal costs a bit to raise, even on grass and grain. So I remember my grandmother putting the big pressure canner on the stove, placing what looked to my small-child self like an enormous head into the pot, adding water and letting it simmer all day long. After a while, it began to smell wonderful. No resemblance to the Lord of the Flies, which also featured a pig’s head. When the head had simmered until the meat had fallen off the bones and had turned into a sort of mush, the bones were fished out and the broth and meat scrap mush poured into long, shallow glass casserole dishes. These were allowed to “set” and solidify into a sort of jelly mass. Pork broth does this naturally. Our headcheese, as I recall, was only seasoned with salt and pepper. It was delicious, and it was another seasonal delicacy. One pig equals one head. 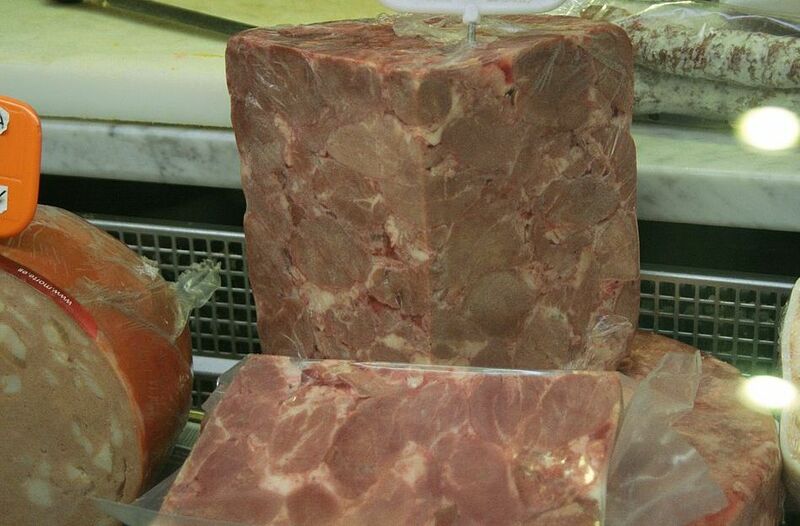 You can get quite a bit of bacon from one pig, but not very much headcheese. Scrapple begins a whole lot like headcheese, and might include the head meat. The bits and pieces of the butchered pig that aren’t made up into anything else go into scrapple. It can include things like the liver and other organ meats, but it doesn’t have to. It gets cooked up into a nice, gluey mess that has that yummy cooking pork aroma. But then cornmeal is added to thicken it into more of a cake like substance that can be sliced and fried. If vinegar gets involved with the pork slurry, then the stuff turns into souse, or pickled pork. If your grocery does buys meat locally and butchers it themselves, there is a possibility that you can purchase scrapple precooked. Even some of the larger supermarkets will carry it. Not all the scrapple recipes or results will be the same because the grain used to thicken it and the spices can vary from cook to cook. For that reason it is a good idea to buy a small amount and sample it, if you can, before using it in any of your recipes. The best way to cook scrapple if you don’t have a farm or access to the scraps from your own butchering, is to visit your local butcher. He or she might have pork scrap left from other cuts and be willing to sell it to you. If that is not the case, look for fresh ground pork, pork neck bones, and other less desirable pork meat cuts. You can purchase pork liver and similar meats if that appeals to you. Pork trotters or hocks are good, and so are pork tails. You’ll want five or six pounds of meat on hand. For this stage of the cooking process, it is easiest to cook scrapple on the stove. Place the meat, onion, celery and bay leaves in a large pot and cook until the meat is falling off the bones. Separate the stock and the solid bits. Reserve the stock separately, then pour the solids into a large baking tray and remove the vegetables and spices. Run the meat through a food processor on chop – don’t over blend. Return one gallon of the reserved stock, the meat, along with the pepper, cayenne and sage to the cooking pot. Bring the meat and broth mixture to a near boil. Meanwhile, mix the two kinds of cornmeal together in a separate container. Have a dry cup or ladle to use to scoop the meal. Butter several large, glass or metal baking trays while the pot is re-heating. When the pot is hot, add the cornmeal a scoop or so at a time, and stir constantly. 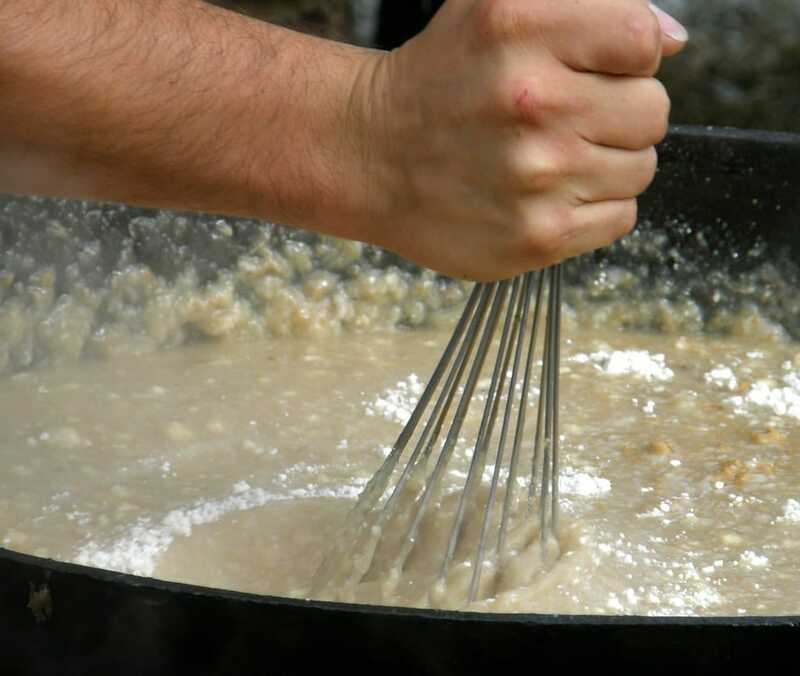 The grain will begin to thicken the mixture. Continue the process until all the measured-out meal is in the pot, then simmer, stirring constantly, for about another 15 minutes to ensure that all the grain is cooked. Just in case you missed it: Keep Stirring!!! This stuff is like gravy. If you don’t stir it, it sticks and it forms lumps. When the mixture seems to be completely cooked, about the time your kitchen timer dings and your arm feels like it is ready to fall off, remove the mixture from the heat and begin spooning it into the waiting baking trays. You will want the mixture to measure about three inches deep in each tray. Place the trays in the refrigerator and allow the mixture to solidify – preferably overnight. Scrapple makes a super breakfast. When you fry scrapple, you have your meat and cereal all in one go. First butter a heavy frying pan. Heavy pans distribute the heat better than lighter ones. Place it on the stove to preheat. 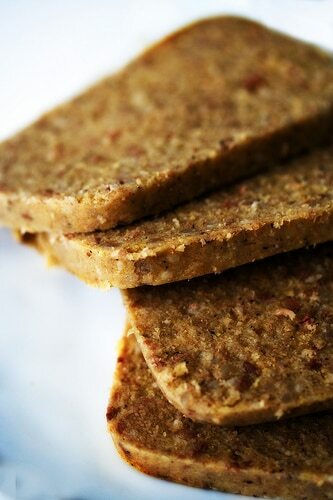 Remove one of the trays of scrapple from your refrigerator and slice it into half-inch slices. Carefully place the slices in the hot pan, and cook scrapple crispy on the outside, but still tender in the middle. If you want to cook scrapple without it falling apart, the key is to use a minimal amount of oil and a wide pancake turner to flip it over during cooking. Serve hot. Top with syrup or applesauce. It is so easy to cook scrapple in the oven. Simply remove one to the baking trays from the refrigerator, place it in the oven, and heat at a slow temperature (around 350 degrees Fahrenheit) until it has reached at least 150 degrees Fahrenheit in the middle when checked using a meat thermometer. Serve the scrapple the same way you would meat loaf. 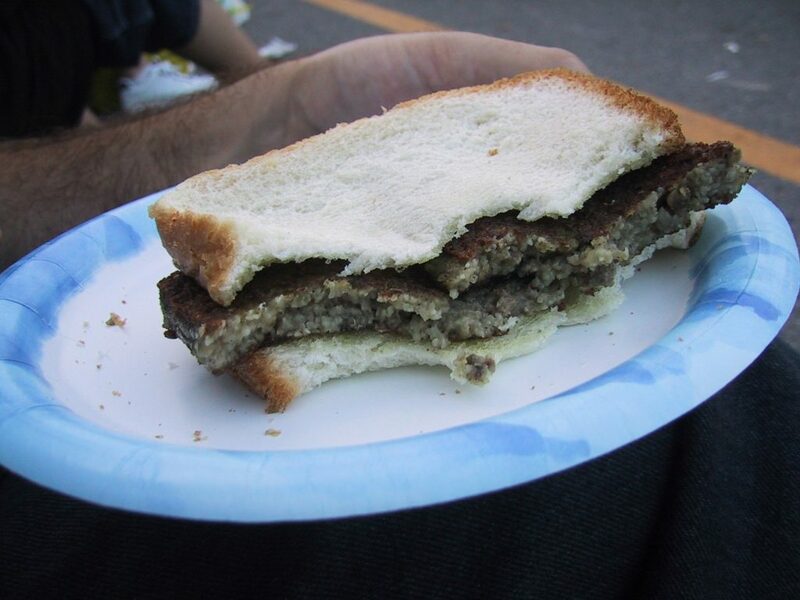 Cut the hot scrapple into slices. Serve with a vegetables sides such as green beans, carrots, corn, broccoli or cauliflower. You won’t want potatoes or rice as a side since the scrapple already has a high grain content. Alternatively, especially if your scrapple turns out a little crumbly, you can use raw cabbage leaves to turn it into a vegetable wrap. Again, serve with a second vegetable since the scrapple already has plenty of carbs. There is a chance that having had scrapple for breakfast and scrapple for dinner, you might want to save the rest of your scrapple for later. The good news is that it freezes well. First tuck a covering of aluminum foil over the top of your baking dish, if you are fortunate enough to have one that it of the freezer to oven variety. Next, wrap the foil covered dish in freezer paper or place it in a large ziplock plastic bag to help prevent freezer burn. When you remove the scrapple from the freezer, you can cook frozen scrapple in the same way you would any other freezer meal. Keep the foil over the pan during the initial heating, to help keep it from drying out. Use a meat thermometer to check the core temperature. 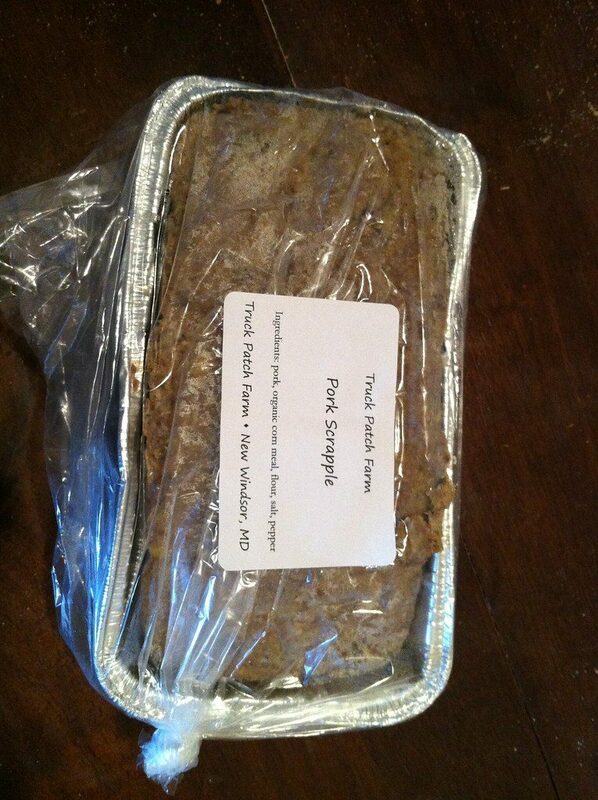 If you don’t have a freezer to oven dish, you can slice the scrapple and package it in personal sized packages. These can be heated up in the microwave using the same setting as you would for meat loaf, or they can be added to lunches while frozen and microwaved at work. 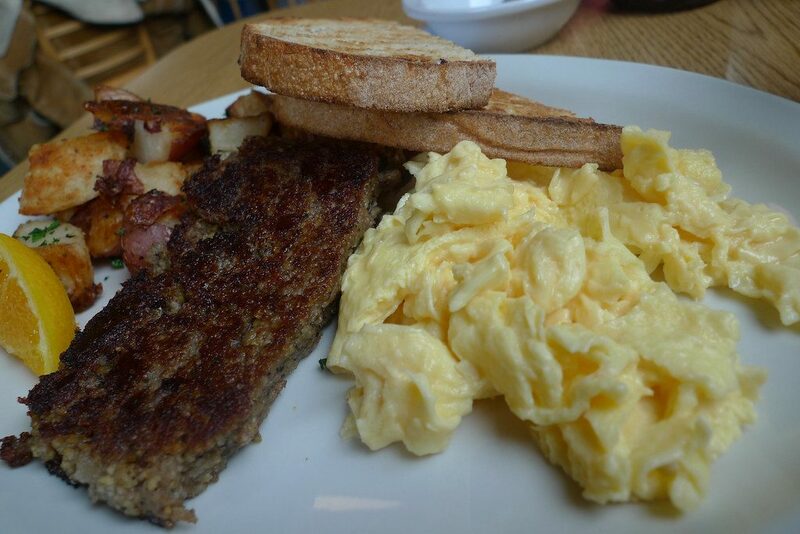 Scrapple is a traditional dish of the Northeast seaboard. It is called pannhass by the Pennsylvania Dutch, and is considered to be an ethnic food often served by the Amish or Mennonite communities. It is a versatile food that can be eaten at any meal. Thanks to its dense texture, it can easily be added to lunches. It will spoil, so it does need to be in a thermal lunch box if refrigeration isn’t available. You won’t need pancakes, cereal or bread with Scrapple because it is already dense with cornmeal. But it goes great with apples, pineapples or similar fruits. It can make a quick, pick-me-up snack between meals, as well as being a good part of a regular meal. It is a good way to stretch you personal budget. If you know a local butcher, you just might be able to get the ingredients at an excellent price and help him or her with those unsalable bits that are left over after creating the more expensive cuts of meat, such as pork roasts or steaks. Best of all, it tastes great. If you know how to cook scrapple quite well, you can vary the herbs and spices that you add to come up with the scrapple that is your own, perfect dish. Whisper this very, very softly: it is a close relative of fried cornmeal mush, which is a super-simple, super easy dish to make. But it is to cornmeal mush as plain oatmeal is to sweet, crispy oat cakes. Which is to say, when it comes to flavor there is no comparison.